The next time you're in a specialty produce shop and see a small, pink-colored fruit with spiky hairs on the skin, pick it up: this is the rambutan fruit, an exotic fruit native to Malaysia and Indonesia. A close relative of the lychee fruit, another fruit common in Asian cuisines, this fruit may also be orange or yellow, and it imparts a flavor similar to grapes in its juicy, white flesh. A 100 gram serving of rambutan fruit contains 84 calories. If you follow a 2,000 calorie diet, this accounts for 4.2 percent of the calories you may consume daily. The number of calories your body needs, though, varies depending on your weight, height, lifestyle, gender and age. See your physician or nutritionist to determine the right calorie intake for you. Rambutan is a very low-fat fruit variety, containing 0.1 gram per serving. 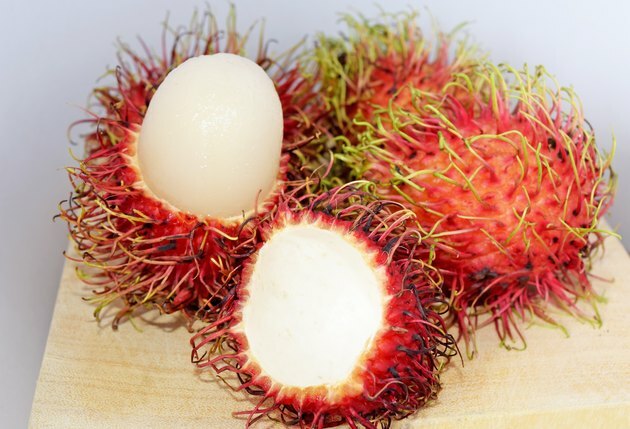 You will also get a small amount of protein in a portion of rambutan – 0.7 to 0.9 grams. Most of the calories in rambutan come from carbohydrates. Each 100-g portion contains 14 to 14.5 grams, or 10.7 to 11.1 percent of the 130 grams recommended by the Institute of Medicine for daily consumption. Incorporating a serving of rambutan fruit into your diet gives you a big boost in vitamin C. Each 100-gram portion contains approximately 40 percent of the daily recommended intake of this vitamin. The foods you eat must provide the vitamin C you need each day, as your body does not have the ability to store it for later use. You will also get about 1 percent of the daily-recommended intake of niacin, also known as vitamin B3. One serving of rambutan serves as a good iron supply, providing 13.8 to 31.2 percent of the amount you need each day. The iron in your diet promotes the right level of oxygen in your body, which can help prevent the fatigue and dizziness that come with anemia, a condition occurring from low iron. In a serving of rambutan, you will also get 4.3 percent of the daily recommended intake of phosphorus. Phosphorus helps filter out waste in the kidneys and is necessary for the growth, maintenance, and repair of all tissues and cells. Rambutan also contains a trace amount of calcium; calcium and phosphorus work in tandem to strengthen your bones and teeth.